Well run property. Easy to get to the UC Riverside campus. This is a good hotel for college campus visit or tour. It’s simple. Small space for breakfast. Excellent value and the rooms were well cared for and clean. 1 night stay. Very friendly front desk. Very clean room. Semi-modern and good value for the money considering it's a motel. Great proximity to UCR and everything you need is within walking distance. Convienent free breakfast. Was worth the money not the best thing in town, but for the price it is worth it. Good location had no issues. Thank you so much! Love staying here. Staff is great. Never a problem. Great place to stay while visiting family at UCR. Continental breakfast was ok.
Hotel met all requirements and has excellent location near UCR. Ask for second floor location if possible. Staff is really nice. Love staying here. Comfortable. Recommend this place to anyone. If you need a place to stay close to UCR, you can't get any closer. You can even walk to campus. But the hotel is just ok, the couch that was in the room looked dirty and the chair in the room had seen better days. The rooms must have been painted since you can see paint marks on the curtains. They did offer free breakfast, mainly danishes and a waffle maker. This is in Good Location I don't like their beds very unconfortble. I had a great stay while working in the area. This is a great location to resturaunts and a shopping center. The shower and tub are awesome. I came down to participate in a 24 hour endurance event. The hotel was located less than 10 minutes from the event. There were restaurants within walking distance as well as a movie theater and Starbucks! The hotel was right off the freeway so it made other area travel easy. The bed in the room was comfortable. They had a mini fridge, microwave and coffee pot which made things easy for us. There was a couch which helped for storage of personal items and the hardwood floor was great. The only bad thing was no pool. Will stay there again next year. University of California-Riverside is within a mile (2 km) of Dynasty Suites Hotel Riverside, and other popular attractions like Riverside Convention Center are within a few miles (5 km). This 33-room motel has conveniences like free breakfast, free in-room WiFi, and free self parking. A flat-screen TV comes with cable channels and a DVD player, and guests can stay connected with free WiFi and wired Internet. The bathroom offers hair dryers and free toiletries. Other standard amenities include a refrigerator, a microwave, and a coffee maker. 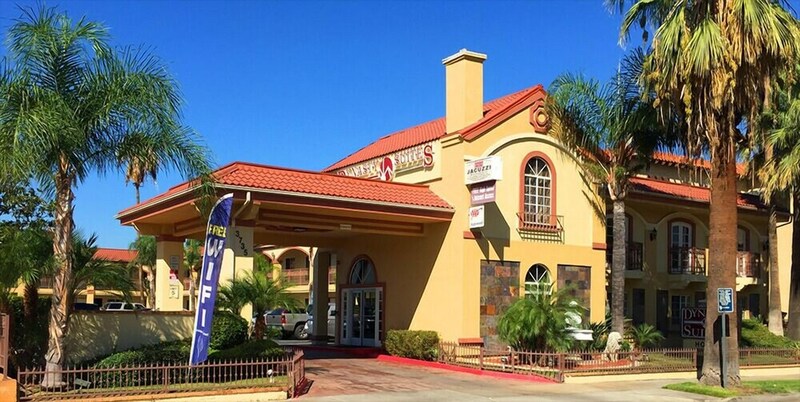 Dynasty Suites Hotel Riverside features free WiFi in public areas and a computer station. If you plan to drive, free parking is available. The 24-hour front desk has staff always at the ready. Thank you so much for your wonderful review, it is greatly appreciated. See you soon! Thank you so much for your lovely review! See you soon. Thank you so much for your review! See you soon. Thank you for taking the time to review our property. We regret to know about the migraine you had after. I do not know that it could have been caused by anything in the room. Thank you for choosing Dynasty Suites Riverside! Thank you for taking the time to write a review on our property. Every comment and suggestion is important and is taken into consideration. Thank you and hope to see you soon.